As we have just started 2019, 🎉 we have another perfect opportunity to review our lives, opportunities, values, and expectations. Well, the reason why should everyone, especially engineers, invest in 2019 takes into account all that and more. I believe that everyone should understand how money works, in order not to be controlled. Building financial independence is an excellent way of building up your life in a way that will provide you with the freedom for you to fulfill your dreams. Those dreams might be building your projects, travel, or teaching, to mention a few I have. If you have a low but steady passive income, you will have time to focus on what matters. And how to achieve that? To do so, you have to know how money works. There are lots of good starting points that tackle the issue. Check some references at the end of this article. Engineers are in theory able to tackle investments interestingly. First of all, engineers tend to approach problems methodically and in a logical way. We want to go straight to the point; we don’t want to read a 600 pages book to check that, in the end, only 50 were related to investments. Second, engineers might think they can pick stocks (for instance) because they’re used to looking at systems that, with intelligence and correct understanding, can be manipulated to their advantage. While it might be a good idea and work sometimes, careful: the market self-corrects and might behave unpredictably. Furthermore, engineers familiarized with programming have an additional advantage: they can create their tools to implement their way of dealing with the market. Enough introduction talk, let’s get to the point. One of the safest ways to make money is investing in financial products, for instance, stocks. Stocks are an excellent way to introduce and approach this thematic. What drives the markets, in particular the stock market, is human emotion, and not logic . When you are using a demo account, you are not investing your own money and, consequently, you might not act as you would in a real situation. That’s why I believe that you should enter the market as soon as possible, even if you lack knowledge. You will learn not only about the market but also about yourself as an investor. You start gaining practical experience on the first day. That matters. Yourself. Invest in knowledge. Learn. Buy books and courses that you believe worth your money, time and attention. After learning the basics, it is essential to enter the market slowly, to gain valuable experience. After that, you can find a mentor, consolidating your knowledge and build a framework for investing (your way of doing things, mainly). This subject is difficult to cover adequately in this article. In this article, we are going to focus on the basics of the stock market, because it is a steady and statistically secure way of obtaining returns 📊. Keep in mind that you do not have necessarily to invest in stocks or even traditional financial products (such as stocks, bonds, forex, deposits, obligations). You have other forms of investment like cryptocurrencies and real estate. Are they suitable, risky or a good option? We will cover that on another article. Companies have their property and their financial capital divided into stocks. A stock is a title that represents such a property. When you own a stock, you own part of a company. Some companies like Apple and Google have their shares available in one exchange. Those are available to everyone that wants to buy them, through a bank or a broker. Through a broker or bank, people place sell or buy orders. When the sell value equals the buy value, a match happens. Hence, a transaction occurs. The price of the last sale is the price of the stock. What determines the price of a Stock? Companies issue stocks and, therefore, have a significant influence on its initial price. After that, the value of the last transaction is the stock quote or estimate. The stock quote varies during the exchange session. Supply and demand determine its price. I recommend you to invest 10%–20% of your income gradually, even if it’s not a lot. The question refers to a very famous investments principle: pay yourself first. Let us suppose that you are a recent graduate and you live in Lisbon. Your income is $1000. You decide to take 10% of the total, 100$. $500 fade right away between the rent, food, and transportation. You have still $400 to save or spend. Next month, you do the same. In one year, you would have $1200 invested, without sacrificing your lifestyle. Do not invest you can not afford to lose. Investing is not gambling, but some situations are out of our control. And you can not merely predict everything accurately. How to make money with Stocks? By taking advantage of the variation of the stock prices, one can make money by buying them at a low cost and selling them at a higher price. Bear in mind that brokers charge commissions for buy/sell orders. How does Stock price vary? If a company is performing well (good reputation, good profits), the investors will be optimistic about it and buy shares. If more people buy stocks, the demand rises and, consequently, its price. On the contrary, if a company is performing poorly, more people will be likely to sell their shares, making its worth to get lower. If buying few low-value stocks, the commissions add a significant overhead (it is difficult to the profits to cover the commissions). How does the company value relate to the stocks emitted? The company value is given by the value of the stock times the total number of stocks emitted by the company. Consequently, it does not make sense to compare directly the price of a commodity, but rather the market capitalization of a company. The value of a stock is fixed at an initial public offering. After that, it is dictated by supply and demand. How to choose the right companies to invest in? First of all, you should invest in companies, not just in one company. A critical factor in a portfolio is diversification. A diversified portfolio is way more robust and reacts better in stressful situations. Simplistically, as the first approach, the companies worth more are the companies which have better profits and have the best balance. But this is often not enough. A reasonable investor makes an ex-ante evaluation based on the state of the company and indicators (discussed in a future article). Investors like Warren Buffet invest mostly in either blue-chip companies or companies that he believes that will perform well in the long run (10 years, for example). In other words, for him, the stock market it’s about patience, knowing what you are buying and looking at the long run. For me, this is a particularly helpful approach, because you don’t have to concern about the performance at your stocks every second of the day. You buy shares from a company you know it’s a good player. You wait. You get a positive yield. The teaching is buying safe stocks. You should invest most of your money in this kind of companies. Is it wrong to take risks? Investing in stocks can be risky, like everything in life. Without financial education and good sources of information, investing is not better than gambling. A reasonable investor understands the system. In the end, investing is about to minimize risks, while maximizing returns by using available information. 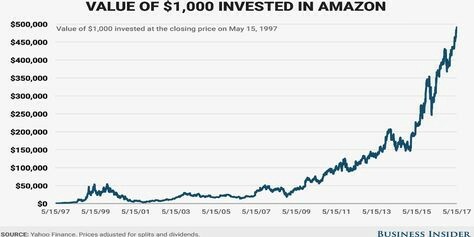 If you invested $1000 in 1997, in 2017, you would have around half a million dollars. You might have picked ten companies. All nine could have gone bankrupt. But if you chose Amazon, you would still make a good profit. 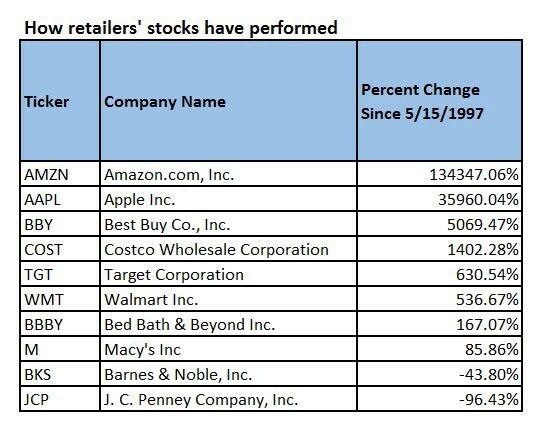 In a simplistic perspective, the companies that sell the most and have higher returns while having a low passive are the most valuable. How to predict the future value of the Stocks of a given company? By analysing a company’s trends, you may get hints where it is going. There are two main ways of analyzing stocks: technical and fundamental analysis. Fundamental analysis techniques involve analyzing some company’s metrics called “fundamentals.” Those fundamentals can be quantitative, such as profits and price per earnings, or qualitative. Qualitative metrics include aspects related to the company analysis, industry analysis, macroeconomic indicators, and future profit outlook. Technical analysis techniques believe the study of the past trading activity and price changes of stocks are a better way to predict its future price. Technical trading analyzes short-term price movements, with indicators such as the relative strength index (RSI), and the moving average convergence-divergence (MACD). Fundamental analysis studies the intrinsic value of a business, and also takes into account macroeconomic factors while technical analysis analyzes past market performance. Typically, technicians are usually short-term traders whereas fundamentalists normally aim for the long run. Fundamental analysis is, therefore, meant to be applied strategically, over more extended periods. There are no quick money-makers with low risk. Technical analysis enables traders to make the right move at the proper moment, by trying to avoid buying high and selling low. It may be a good idea to take teachings from both perspectives. With both, you can make a position based on the fundamentals of a company, while avoiding buying into stocks that have been overvalued. Of course, sometimes 💩 happens. Stay away from speculation and quick-money promises (if a Nigerian prince sends you an e-mail with hopes of making you rich, beware). What happens when 💩 happens? 1) Stay strong if you think the market will normalize and you think you are recovering your money (in the long term). In other words, stay tight and don’t sell. 2) If you think it’s more than a temporary situation, sell, and therefore cut losses. Not everything is negative in a bear market. Typically, it is a synonym for excellent opportunities. Like the Portuguese say, “after the storm comes the good weather.” After a significant drop in markets, it will heal itself and grow. Most investors recommend buying stocks when the sentiment is negative. The best time to buy stocks is when everyone is in panic and selling stocks for a (way) cheaper price. How to pick the best decision? It depends on your experience. If you don’t feel comfortable acting alone, it is important to find a mentor. Why is it important to find a mentor? Essentially, your mentor is your role model. If you lack the time or knowledge to get to know companies in depth, having mentors and taking their advice might be an excellent shortcut to success. You don’t have to make the same mistakes, lose equal opportunities or take longer to learn if you have someone willing to teach you. Nor, you don’t have to spend fortunes to have advice. My five cents on this: good mentors are the ones that help healthily. For that, it is important that your values are aligned with theirs. It has to be someone that you trust, or you are very likely to put your confidence on. Someone with whom you would like to work. There are thousands of mentors in this beautiful world. Reach them. Ask if they could help/mentor you. It may be as simple as that! Some may charge a lot, whereas others not. Maybe you can offer something specific (engineering skills are useful) to that person and build a relation. Sometimes you need to keep pushing yourself and stepping out of your comfort zone. Good thing you asked! Next, a list of good starting points for beginners (written in English and Portuguese). Investopedia: Wikipedia for Investors. Extensive materials, from beginner to advanced topics. It also has an advisors’ section. Mr. Money Mustache — Thanks for the reference, João Nabais. The blog of Darius Foroux. Several topics, not only about investments. One of his piece I consider the best is this. Also has a very nice podcast which tackles productivity, personal development, and entrepreneurship. You have at your disposition tons of blogs — some lists: here, here and here. Those lists contain an excellent diversification of thematics, written by experts on different fields. O Labirinto da Bolsa — 20 Caminhos sem saída e um método para um retorno elevado, by Cesar Borja. An an absolute must for people that think about investing in the stock market. Contains the lessons and advice from César, which has more than twenty years of experience in the field. Better than that, he teaches informally, while still being objective. I recommend this free online course (around 30 minutes) by Cesar Borja and Catarina Borja about the stock market. Great and simple introduction. Ganhar em Bolsa, by Fernando Braga de Matos. Provides the tools and frameworks to gain money on stock exchanges. Renda Maior, by Ariana Nunes. Although it is on its early steps, she can deliver incredible content — a very good place to start learning. Ariana helped me to begin researching and diving into investments through her videos. Completely unbiased, she goes straight to the point — a must. Blog Contas-poupança, by Pedro Andersson. Directed on how to save money. Without money, you can not invest. Pedro gives you a ton of useful advice on how to save money. His famous book, Contas-Poupança — Poupe ainda Mais, Invista Melhor has dozens of saving tips (some of them really out of the box). Blog Doutor-finanças, also aimed for savings. Blog Investidor, by Nuno Casemiro. Nuno shares investment ideas, so its a good complement to the other resources. These should give you a good starting point. If you believe that some item deserves to be on the lists (especially if it is not popular), please comment, so we can share that with others. Start investing as soon as possible. Start learning today. We reached the end of Part 1. Quick, right? I will write an article with the various financial products you can invest, as well as one analysis on what to avoid. If you prefer to read an article on how to perform an analysis on companies, please leave a comment 🙌. Make sure to follow me to share the story with someone that needs an introduction 😁. P.S. For the ones of you who have the passion for writing, here is something I would like to share. Why Should Everyone Invest In 2019 (Attention, Engineers) was originally published in Hacker Noon on Medium, where people are continuing the conversation by highlighting and responding to this story. Next PostNext Is the Malta ICO regulation crypto-friendly?